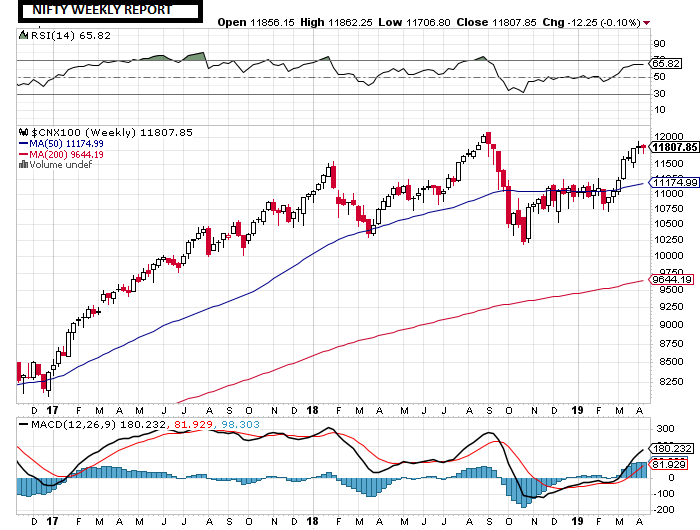 Nifty crossed another milestone as its rose above 11800 for the first time. It is strong close for the as it closed near to 11800. The Sensex was up 369 points at 39275, while Nifty was up 96 points at 11787. The Sensex and Nifty touched record highs of 39364 and 11810 respectively in today's trading session. As polling for Lok Sabha elections is underway, Nifty's price structure is indicating a major shift in trend direction. The rally in the market has been mainly due to aggressive buying by the FIIs; and for valuations to sustain there needs to be an uptick in earnings growth this quarter. Tomorrow market will be shut on accounts of "Mahaveer jayanti". "BUY RELCAPITAL 180 CALL @ 8 TGT 10/12"
"BUY ICICIBANK 385 PUT @ 3 TGT 3.9/4.8"
Bulls are back in action & took nifty above 11700 but nifty close. Indices ended higher but off day's high on Monday with Nifty finished below 11700 level. At close, the Sensex was up 138 points at 38905, while Nifty was up 46 points at 11690. Market took positive cues from Asian peers, where equities neared nine-month highs on easing of concerns about the US-China trade conflict. Trade talks between the two countries were approaching a final lap, while strong Chinese export and bank loan data boosted confidence in the global economy. The index formed a bullish candle on the daily scale and needs to hold above 11700 to extend gains towards 11800, and then 11900 -12000 zone. Overall setup and momentum is positive and a hold of recent zones could extend rally, while support exists at 11650 and then 11600 levels. It has been making higher top and higher bottom formation and supports are gradually shifting higher with medium term support at 11500. The domestic stock markets broke out of the range-bound trading in afternoon trade ahead of the release of key The macroeconomic data and quarterly results of IT majors TCS and Infosys changed the market sentiments. The nifty closed the week above 11600 mark at 11,643. Trading for the week kick started on a positive note slightly above 11700, very much in-line with other Asian peers. However, it looked like a fragile gap up opening and hence, markets started coming off immediately from opening trades. In fact, the selling aggravated as the day progressed and hence, we not only erased early morning gains but also went on to sneak well below key support levels by shedding more than 100 points from previous close. Fortunately, some buying emerged at lower levels which pulled the index to reclaim the 11600 mark on a closing basis. Tuesday Nifty opened flat as there was no major trigger on the global as well as domestic front. During the first half, index did not have any strength to climb higher and hence, we almost went back to previous day’s low. Fortunately, there was sudden buying interest seen at lower levels and hence, markets reversed before it breaks previous day’s low. In fact, as we were approaching the fag end of the session; the buying momentum accelerated across the broader market, leading Nifty to close at the highest point of the day by clocking over half a percent gains. Tuesday’s smart recovery was followed by a disappointing start on Wednesday mainly on the back of unfavorable cues from the global peers. During the first half, index made couple of valiant attempts to move towards the 11700 mark; but all those attempts turned unsuccessful. In fact, the selloff aggravated post the midsession to eventually sneak below 11600 on a closing basis. Thursday, our markets started on a muted note in the absence of major action from global cues. Subsequently, following the weakness of the previous session Index traded under pressure during the first half. Last few hours were however better as we saw index rebounding a bit after finding support on key levels to eventually end with minor gains tad below 11600. Bears continued to grip the markets…!!!! Thursday’s Lackluster trading session ended on Negative Note. Nifty toggled between gains and losses on Thursday amid cautious trade, tracking weakness in Asian peers on concerns about global economic growth among traders. The market cracked heavily in trades today on account of March quarter earnings of TCS & Infosys due tomorrow 12 april 2019. For most part of the day, the sensex & nifty fluctuated between gains and losses and the Sensex swung at least 10 times between the positive and negative territory. The Sensex rose 22 points to close at 38607. The Sensex moved in a range of 135 points, between 38649 on the upside and 38513 on the downside. 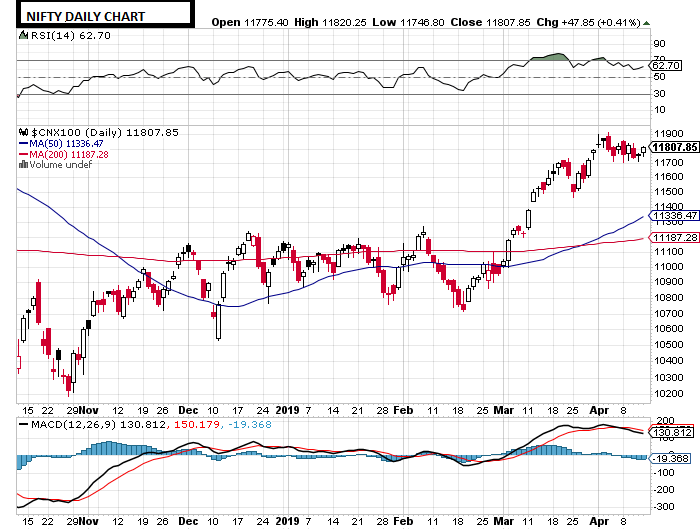 The Nifty advanced 12 points to end at 11597. The Nifty touched 11604 at the day's strongest point, and dipped to as low as 11566 during the session. "BUY NIFTY 11600 25 APRIL PUT @ 101 TGT 116/130"
Bears continued to grip the markets…!!! !The market cracked heavily in trades today after the International Monetary Fund downgraded India's growth forecast to 7.3% for 2019. The Sensex fell as much as 397 points to touch intraday low of 38542 and the Nifty index dropped as much as 100 points to intraday low of 11571. IMF's cut in growth outlook comes after ADB and the Reserve Bank of India cut India's economic growth outlook to 7.2% for 2019 earlier this month. Also caution ahead of the March quarter earnings season is leading to investors stay on the side-lines. Bulls & bears were on roller-coaster ride today. After witnessing a weak opening; by the latter half the mood was tilted towards the upside. The market breadth was weak but was inclined towards the buyers. All the indices were in the green except media and defensive sectors such as IT and pharma were up mainly because the rupee traded higher compared to the US dollar today. "BUY RBLBANK 640 PUT @ 11.20 TGT 14/17.5"
"BUY RELIANCE 1380 CALL @ 18 TGT 24/30"
Bears continued to grip the market. The Sensex fell over 160 points and the Nifty dropped below the 11600 -level in early today’s trade. Final hour buying helped the Nifty to finished just above 11600 level. The Sensex was down 161 points at 38700, while Nifty was down 61 points at 11604. Markets were reacting on crude oil prices rising to their highest level since November 2018, owing to OPEC’s ongoing supply cuts & US sanctions against Iran and Venezuela. This was followed by a weak rupee that acted as a double whammy.